I want to register my concern for what I consider a dangerous transition to an armed police force. I am in matters of public safety conservative and believe that officers do need to be properly quipped to deal with a dangerous world, but I have never bought the argument that a university police force needs to be armed. Indeed, it is most effective when it can act as an intermediary between the university and the community. That advantage, and it is one that serves the interests of both the university and the the community, would be seriously compromised or lost if the UO officers start to carry weapons. I have had regular appointments at many universities in the US and in Germany, and most function quite well by cultivating a good relationship with the local police force, but they do not try to duplicate efforts. I do realize that many higher administrators must be telling you otherwise, but if you listen to the faculty you will quickly come to see that there are many among the faculty who have very significant reservations about the course and costs of this transformation. Indeed it is very hard for me to see any advantage that an armed ‘police’ force would bring. Moreover, I [and I believe others] see many disadvantages and costs that will accrue from such a decision. The question is whether UO should have this “in-house” with full responsibilities, oversight, and risks or contract with well-experienced law enforcement entities providing sworn officers on campus. OSU does not have a sworn university police department. But their Public Safety department has a contract with Oregon State troopers for these extra services on campus. OSU has no intention to change it. Why does UO? Is UO so much more in danger? Comparing UO to other PAC12 schools with University Police such as UW, UCLA or Berkeley is just silly. Whenever I saw one of the new SUVs or the 4×4 I wanted to take my key and scratch “I could have been a dissertation fellowship” into the paint. (Something I would never do to any other car!) These expenditures are just a pure provocation for anybody who cares about affordable education, support for faculty, (graduate) students and staff, and academic infrastructure. It appears as nothing else than pure rent seeking by UOPS. 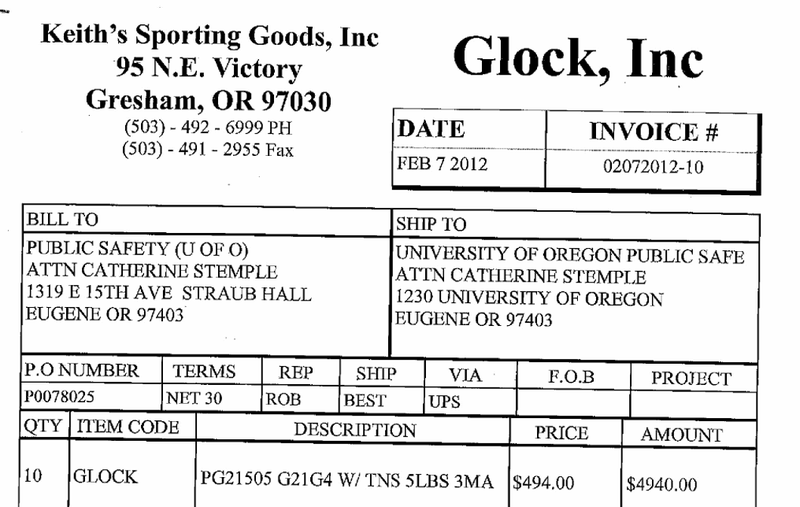 I would appreciate if there would be an update about the “cost savings” that were promised (if Frances Dyke “lied” she should apologize in public to UO and Salem) and if there were any other motives — covering up weed smoking athletes/students in the university neighborhood, subsidizing the athletics department by providing in-house security at sports events instead of costly EPD/county officers, increasing some egos of the leadership, or improving the relationship with EPD because of “rowdy” undergrads in the university neighborhood by covering the area. All these motives might be taste but at least there would be a rationale for the nonsense and money burning. It may make the provocation a bit more bearable. Otherwise the UO admin should just stop the nonsense and gain some credibility – providing resources for UO’s mission. What’s this really about? Nina Bernstein, reporting in the NYT last year, has some reasonable suspicions. And then there are the less expected costs of having a campus police force. 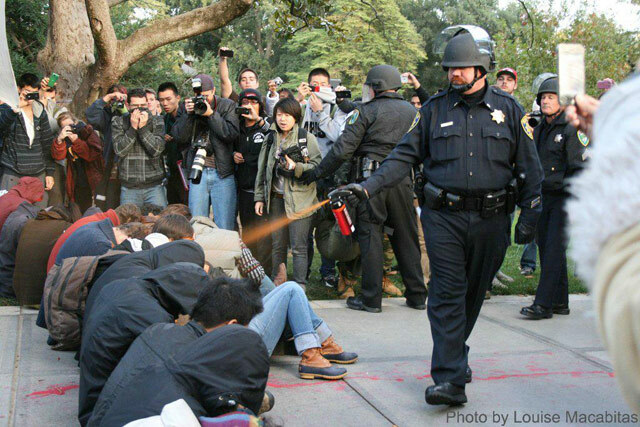 From the WSJ: UC Davis Reaches $1M Settlement with Protestors over Pepper Spray. For a contrast, remember how well UO handled our own Occupy situation, with civilians in charge? Third straight DPS director leaves under weird circumstances. Update: Wondering how DPS managed to increase spending from $2.8 million in 2010 to $4.0 million in 2012? Financial Transparency reports here. A few days ago the RG had a story on the $2.8 million budget for security at the Olympic trials, $500,000 of which came from an emergency state appropriation. Then our DPS Director resigns the day before it starts, effective immediately? I do not believe this email from Jamie Moffitt. If there are legitimate reasons for keeping things secret, then at least tell us you can’t tell us the whole truth. The UO administration has zero credibility on DPS now. Doug Tripp, executive director of the UO Department of Public Safety and chief of police, has informed me of his plans to return to the Midwest in order to move closer to his extended family. Given the importance of the University’s police department transition plans, Chief Tripp has stepped down from his leadership role so that the University of Oregon can select a permanent replacement who will see this transition through to completion. I have asked Carolyn McDermed to serve as interim executive director and interim chief, effective immediately, while a national search is conducted for a permanent police chief. Until Chief Tripp secures a new position in the Midwest region, I have asked him to serve in an advisory capacity, assisting me with specific issues related to police department transition planning. I want to thank Chief Tripp for his years of service to the UO. He has been instrumental in helping define and lead the transition from a campus public safety department to a sworn police force. We wish him well in his future endeavors and appreciate his current effort to ensure a seamless leadership transition for the department. In addition to running the department’s day-to-day operations, Interim Chief McDermed will be tasked with continuing the University’s police transition until a permanent police chief is named. The University of Oregon remains dedicated to implementing a community-oriented and trust-based policing model that addresses the unique safety and security needs of UO students, faculty, staff and visitors. The staff of the Department of Public Safety has shown a strong commitment to these ideals and I know that they will continue to deliver on that promise under Interim Chief McDermed’s able leadership. Last year both the legislature and the State Board of Higher Education approved the transition of our campus security department into a police department. The University officially established the UO police department on January 1, 2012 and several officers have now been commissioned and sworn as police. These police officers have the same authorities as others in the state and are required by Oregon law to clearly identify themselves as police. For this reason, you will soon notice University of Oregon police officers in new uniforms on campus. http://dailyemerald.com/2012/06/11/dps-police-officers-to-wear-new-uniforms/. 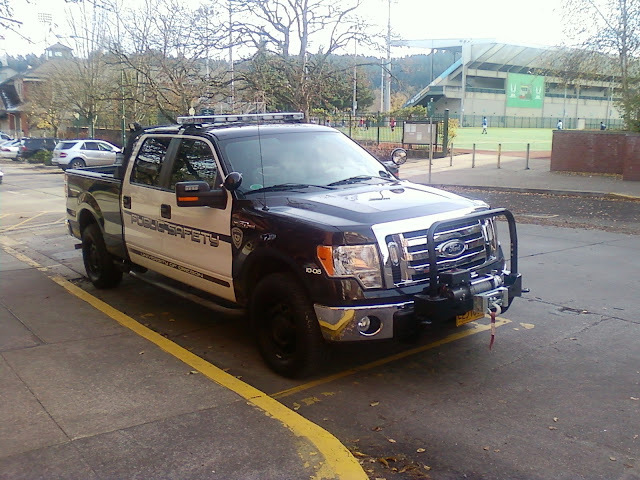 The UO police officers will have the same equipment currently carried by UODPS public safety officers. During the next academic year, the university will host a variety of campus discussions about the issue of arming campus police. These discussions will allow for broad participation by students, faculty and staff. After those discussions and no earlier than Spring 2013, university leadership will make a recommendation to the state board of higher education on whether to arm our police. Please visit police.uoregon.edu to learn more about the UO police department transition. Also, if you have questions, we’d love for you to join us at an informal “Coffee with the Chief” that we will be hosting later this summer. This will be the first of many opportunities for campus community members to meet with our Police Chief to further discuss the policing transition. Please share this with others in your department who may be interested. 4/24/2012. 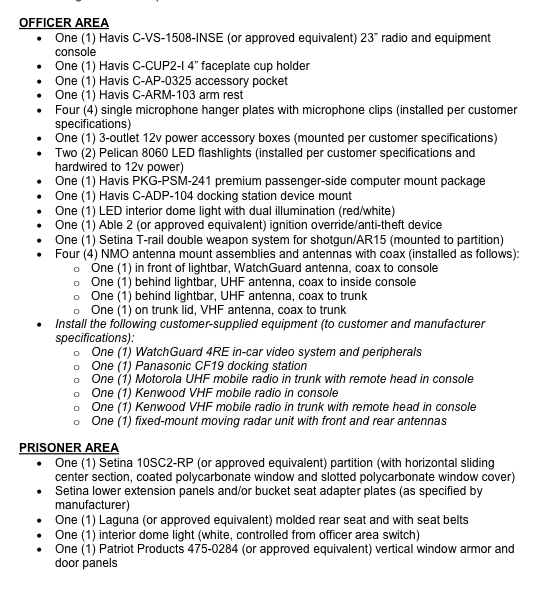 UO has put out an RFP to add dual mounts for AR-15’s and shotguns to the DPS Crown Vic Police Interceptor fleet – so far as I can tell they haven’t actually bought the assault rifles yet. I’m sure there will be those in the physics department who will argue for something with better HEAT capability, but I for one salute our Johnson Hall Officers of Administration for preparing to send our public safety officers out into campus armed with this full-auto classic before bothering about the still incomplete oversight process for DPS. Despite the lack of clarity of the legal basis to remove the tents, the UCDPD operation plans for both November 15 and November 18 stated that camping was not allowed on campus and that tents would not be permitted… A few hours before the operation commenced, Chief Spicuzza, Lieutenant Pike and OfficerP sought legal advice regarding the laws that apply to camping on the UC Davis campus… This call was apparently placed because of the Lieutenants’ continued concern over the legal basis for removing the tents, and the police operation was commenced only after this last-minute call. Note how infinitely better UO’s leadership handled our own Occupy situation, without armed police. So why do we want this now? Thanks to one anon reader for the DPS xerox, and another for the Atlantic story. please keep this stuff coming. Amin’s teammate and brother Abdul Tufa had been recording the arrest with his phone. Shortly after Amin was placed in the police car, DPS forcefully confiscated Abdul’s phone, claiming they wanted the recording on the phone as evidence of the fight and arrest. The UO Police confiscated a student’s phone after he recorded them making an arrest? Is that legal? Should it be? Note that the video also apparently included the original fight. A reader sends along this youtube video on the importance of cell phone cameras when dealing with the police. 3/8/2012. The UO administration is refusing to allow the committee set up to monitor our new police to even call itself an “oversight” committee. They hate that word. So, imagine some football player gets arrested by the UO police for, say, stealing a student’s laptop because it has pictures of him doing bong hits on it. 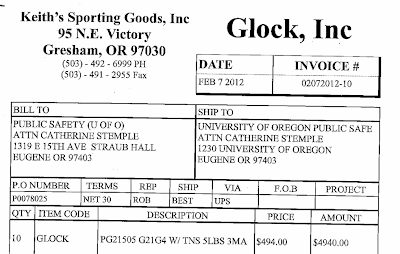 Who will decide whether or not to report this to the Lane County DA for prosecution? Doug Tripp and his direct boss, Jamie Moffitt? The UO President? After consulting with whom? Does anyone know the answers here? Thanks to Portland blogger Jack Bogdanski for the link and the reminder of our earlier post on this. 2/28/2012: That’s the word from Bill Graves in the Oregonian. Please keep any comments peaceful: you never know what the other person is packing. UO’s Police Chief has no previous police force experience or training but (as of last time I looked, about 6 months ago) we already pay him more than Eugene pays its Chief of Police, who has a far larger staff, budget, and more complicated job. I wonder who is minding the store for UO while Tripp is in training, and what it’s costing? When Frances Dyke and Doug Tripp were pushing this idea to the faculty, OUS, and legislature, they told us the conversion could *save* UO money – $73,000 as I recall. I’m thinking we were lied to. 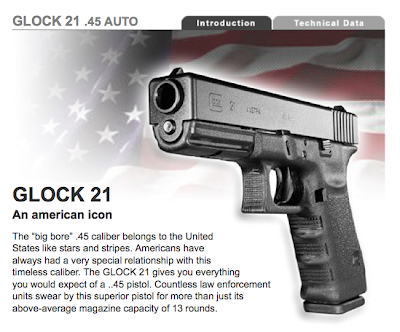 2/15/2012: It’s a popular choice, though the stopping power of the .45 caliber round may strike some students and faculty as overkill for on-campus use. Invoice here, looks like a nice discount for buying 10 with 3 clips magazines each. No ammo or training yet. DPS secretly swore in police officers last week and no one from the public was invited. Free lunch and beverages provided along with the rights to be a cop and arrest people. I heard it was mainly the administrators that were sworn in. So if it was administrators becoming full fledged sworn police then what about the officers? 1/11/2012: At the Senate meeting today Institute for Neuroscience director Shawn Lockery raised the very reasonable question of where UO was going to get the startup money for the 20 new science hires that Russ Tomlin has authorized. A new science hire can easily expect $1 million or so to get their lab up and running – money that UO eventually gets back in grant overhead and in the prestige of staying in the R1 AAU category. But it turns out that former VP for Research Rich Linton and former VPFA Frances Dyke have blown all the startup money on junk ranging from remodeling the General Counsel’s Office in Johnson Hall to the Huron contracts to Bean’s 5 pet ideas to ???? It’s not clear what will happen next. Will Scott Coltrane come up with the money? Out of whose hide? My suggestion? If we can’t give them a lab, let’s at least let them have their pick of UO Police Chief Doug Tripp’s new 4×4 cruisers – since that’s where Dyke spent a bunch of the money that should have gone to research. And as a commenter asks, where was Provost Jim Bean while all this was going on? Asleep, or just clueless as usual? I will say that the fact UO and Eugene managed to avoid an ugly incident of this sort with the Occupy Eugene movement and their brief stay on campus is a credit to all the people involved: the city, the protestors, the people in Public Safety, and some nameless and effective university administrators. I’m sure there’s some lesson in here about the wisdom or folly of having sworn police like UC-Davis rather than public safety officers, but I’m not sure what it is. If you think you do, or want to find out, get involved in the UO Police Oversight process. Their out of date website is here. The faculty and students they list as members have quit out of frustration or graduated. We are going to have a lot of sworn police on campus very soon, with riot gear and the same sort of training the UC-Davis police had. Regardless of how you feel about Prozanski and Dyke’s legislation, it’s now the law, and OUS is going to let Lariviere carry it through. What happens next time – and all the consequences – will be our problem.